Hey guys! As we do every Friday, let’s take a moment to see what new books are coming out next month! And as a forewarning, there may not be a new Spotlight next week as I will find myself away from internet connections on that day. So let’s enjoy today, shall we? Summary (from Goodreads): In this humorous love story from the author of Two-Way Street, an unlikely romance is the best sort of surprise—but the wrong secret can ruin everything. Kelsey’s not going to let one mistake ruin her life. Sure, she got kicked out of prep school and all her old friends are shutting her out. But Kelsey’s focused on her future, and she’s determined to get back on track at Concordia High. Isaac’s been kicked out of more schools than he can count. Since his father’s a state senator, Isaac’s life is under constant scrutiny—but Concordia High’s his last stop before boarding school, so Isaac’s hoping to fly under the radar and try to stay put for a change. When Kelsey and Isaac meet, it’s anything but love at first sight. She thinks he’s an entitled brat, and he thinks she’s a stuck-up snob. So it surprises them both when they start to fall for each other. Kelsey’s happy for the first time in months, and Isaac’s never felt this way about anyone before…But nothing’s ever completely perfect. Everyone has secrets, and Isaac and Kelsey are no exceptions. These two may have fallen hard, but there’s one thing that can ruin it all: the truth. What’s To Like: Ok, admittedly, the cover creeps me out just the tiniest bit. I think it has to do with her eyes, but I can’t confirm that. Something’s just slightly off. But anyway, I’m interested in this because I love a good love story where the characters try to fight love off. I can’t explain it really, but I think it’s the inevitability of it all that I like most. And Barnholdt has a good track record with me for her books. Two*Way Street was really good. Summary (from Goodreads): If you’re a Hunter, there are only three things you must know about the Damned. The Damned can’t lie, can’t live without a body, and can’t leave you alone. Amerie Carter has the blood of a Hunter, unfortunately. She is one of a rare line of women who, upon her sixteenth birthday, will come into extraordinary powers used to hunt the Damned; escaped souls from Hell who take up residence in human bodies. It’s supposed to be her sweet sixteen, but Amerie has never dreaded a day more, and her worst fears are confirmed as the celebration turns tragic when her mother is killed. Grief-stricken, Amerie vows to never hunt a day in her life. She’s determined to hide behind normalcy, attending school, hanging out with her friends and working an after-school job at The Hut. All Amerie wants is to be left alone. But try telling the Damned that. The harder Amerie tries to ignore her powers, the more the Damned come looking for her. 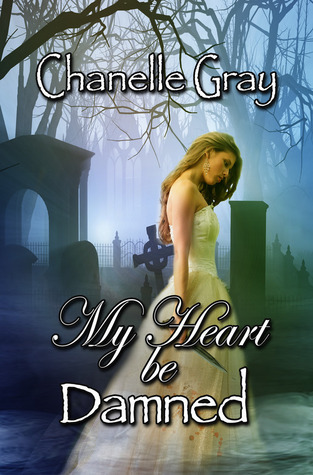 When an attack leaves one of Amerie’s friends in the hospital, and endangers the lives of her fellow students, she knows she has no choice: Hunt or Be Hunted. Thankfully, the gorgeous, secretive, and so-off-limits Marshall offers to train Amerie to take out her supernatural enemies. But training with Marshall means lying to her friends, her family, and confronting the mysterious circumstances surrounding her mother’s death. Amerie soon discovers she’s not the only one with something to hide, Marshall’s secrets might kill her before the Damned get the chance. What’s To Like: Oh, goodie! I love a good story with dark, deadly secrets and super hot guys! I’m very interested in this because of the impending fights. You know they’re coming from the summary alone. I am so ready for another story with a take-no-prisoners female heroine. This totally looks like it could be just the thing for me. Summary (from Goodreads): Evie’s paranormal past keeps coming back to haunt her. A new director at the International Paranormal Containment Agency wants to drag her back to headquarters. The Dark Faerie Queen is torturing humans in her poisonous realm. And supernatural creatures keep insisting that Evie is the only one who can save them from a mysterious, perilous fate. What’s To Like: Time to hyperventilate! This is the end of Evie’s journey and I’m sure it’s going to be fantastic! I love being able to wrap up a series, but at the same time, it can be somewhat heartbreaking. Still, at least we’ll figure out what happens to her! In just a smidgen over a month’s time, we will know what Evie’s fate is and if she can change it. Ugh, now I sound like that trailer for the new Disney movie, Brave.